In news that took everyone by surprise, Playmobil has announced that a new figurine of Martin Luther has become their fastest selling toy ever. Their initial run of 34,000 figurines sold out in less than 72 hours (see Deutsche Welle’s report here). The set was released in anticipation of the 500th anniversary of the Reformation (which will take place in 2017—five centuries after Luther first posted his 95 theses on the Castle Door in Wittenberg). The Playmobil set features a little Martin Luther, complete with scholar’s hat, academic gown and quill. He comes also with an open Bible, which reads (in German) “Here ends the Old Testament” on the left page and “The New Testament translated by Doctor Martin Luther” on the right—a reference to Luther’s famous translation of the Scripture into German, a work often considered the first German classic (much as the King James Version is considered a classic in English). Demand for the toy far outstripped supply, and so Playmobil has announced they will be making more figurines of the little Luther. The next batch should be ready by the end of April. Sadly, however, it doesn’t appear that the toy will be made available to purchase by English speakers anytime soon. It seems the little toy was made in a partnership with Nuremberg’s Tourism Center, and so the toys have been directed for sale in that area of the world. 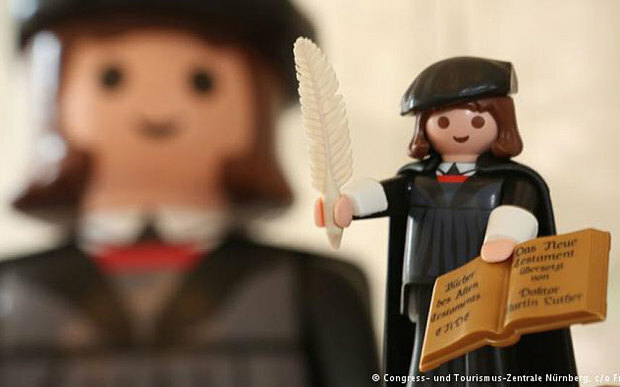 As it currently stands, you can pre-order the Playmobil Luther from Nuremberg’s Tourism Office for a scant €2.39 each (plus tax and shipping). 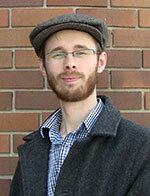 Regrettably, they only ship to addresses in Germany, Switzerland, and Austria. When the figure first hit headlines, I tweeted Playmobil about getting one. They seem to confirm that he’s only available in the above three countries. Maybe that will change in the future, given how widely popular the toy has been (the rapid sell-out has garnered news coverage from many English publications, including The Guardian, The Telegraph, Slate, and Newsweek). There’s certainly interest in North America for the toy. I know more than one organization (churches, for example) who might actually be interested in a bulk purchase. In the meantime, however, you could always ask a friend in Germany to order one for you. Apart from that, you might be stuck trying to get one on Ebay where (last I looked) it seemed to be going for ten times the original cost (plus shipping). I finally opened my Playmobil Luther package, a gift from my sister, after months of wondering whether I ought to keep it sealed as a valuable artifact. Now I am having far too much fun using my children’s old Playmobil collection to set up scenes from my Reformation novel Kingdom of the Birds. Too bad this Martin Luther figure does not have a knight’s disguise. Captain Thin is powered by	WordPress 5.0.4 and delivered to you in 0.432 seconds using 41 queries.